Our Tennis Court which guests are welcome to use. The accommodation at Hartshanger Holidays comprises two self-catering flats; High Hanger and Little Hanger. High Hanger is in what was the servants quarters on the second floor of the main house and has its own personal entrance. It sleeps 4 with 1 double and 1 twin room. Little Hanger is in what was the old coach house. 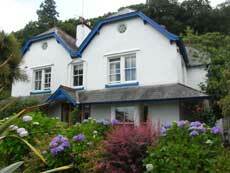 It sleeps 6 with 2 double rooms and 1 twin room. There is also a cot available. On your arrival we provide a welcome pack of locally sourced essentials such as milk and bread. Normal use of electricity and night storage heaters is included. Both flats have electric blankets, hair dryer, iron, TV, video (combined video/DVD player in Little Hanger) and radio alarm clock. Kitchens are fully equipped for 6 people, each with electric kettle, toaster, coffee cafetiere, fridge with icebox, full size electric hob, full size electric oven in Little Hanger and small oven in High Hanger. Both Little Hanger and High Hanger have access to the laundry room in the old tack room. There is a washing machine and a tumble drier, indoor and outdoor drying lines. This also doubles as a secure store for bicycles. Wash down area just outside in stable yard. A cot can be arranged for High Hanger. Little Hanger has a permanent cot. Both flats have high chairs. A freezer for guests use is available in the bicycle / laundry room. 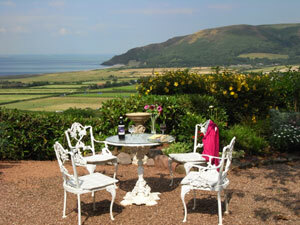 The area around the property extends to about five acres of wooded hillside with many paths to explore and wonderful views across Porlock Bay. In the spring and summer the grounds are ablaze with colour from bluebells, azaleas, camellias, rhododendrons, hydrangeas, primroses and cyclamen. There is an all weather hard tennis court which guests are welcome to use. We have a number of spare tennis rackets and balls which guests may borrow. There is ample space for parking cars and it is safe as we are off the road.